Detox blemishes, dull skin and refine fine lines with Deep Cleansing Gel and Leave-On Invisible Exfoliant & Blemish Remedy. 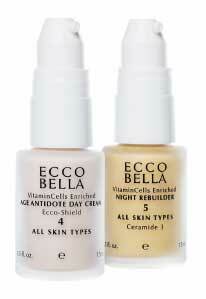 Recharge your skin's productivity withAge Antidote Day Cream and Night Rebuilder. 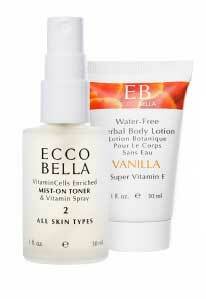 This was my first time trying Ecco Bella products. I have tried a TON of skin care products over the years, only to have dry, flaky, tight facial skin. I ordered the small size products so I wouldn't spend a ton of money on full sizes only to be disappointed. Well, I LOVE how my skin is looking and feeling: silky smooth like I have only longed for for many years! I am super excited to try this. 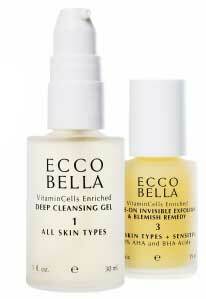 I had been hoping that Ecco Bella would come out with travel sizes for trips. I have used some of their face products before but not all of the ones included, so that is an extra bonus ... now I just have to wait till I leave for my trip to try things out fully. When my travel sized kit arrived I was thrilled to see the skincare line in small sizes that can easily fit into my purse, gym bag or suitcase. I love the cute canvas bag with the flower design on it along with the gold flower zipper pull. The cleansing gel does not dry out my skin and leaves it very soft!